Panelist at ICFF Ignaz Gorischek had some tangible advice for retailers: create experiences in your showroom to build emotions and connections. Here are his best tips. It's always worth attending a seminar or two at a major market because you never know when the conversation might just turn. At ICFF this week during the Making, Marketing and Selling Design in a 24/7 world seminar, moderator Mat Sanders turned the conversation to retail and the current challenges the industry is facing — mainly the internet. For advice, Sanders, who co-owns the boutique shop and design firm Consort Design in Los Angeles, asked panelist Ignaz Gorischek, Vice President at CallisonRTKL and a well-known retail designer who's worked with some of the top brands in retail today, for advice. It's probably no shock to any retailer that Gorischek said the best way to compete with online retailers is by creating an experience. Experiences create emotions, he said, and emotions can create sales and repeat sales. Emotions make the trip to a showroom worth it for the consumer, and they're a lot harder to create online. So what makes an experience? Gorischek said to start with stimulating the five senses. As he spoke, he lamented how many shops and showrooms he visited that did nothing to make him feel welcomed or excited to be there. By engaging with at least three of the customers' five senses — smell, sight, taste, touch and sound — showrooms can start creating positive emotions with a customer before a sales associate has a chance to say hello. Now you can put Gorischek's advice to the test. Here are his two tips on how to engage your customers' senses to create an experience in your lighting or home furnishings showroom. You've probably heard that if you want to sell a house, you first need to bake cookies and fill the house with that deliciously sweet scent. Homeowners want to turn a house into a home, so the smell reminds them of the homes they grew up in and helps them build an emotional attachment to the house they're viewing. Now you don't want your customers to move in with you, but your store can still help create positive emotions with scents. Your customers will feel more relaxed, more at home and more likely to stick around and shop. So it's simple: light a candle. Burn incense. Add a wall diffuser. But what scent is best? Think about the type of atmosphere you want to create. Relaxed? Upbeat? What's your city like? What kind of furniture or lighting are you selling? The only rule when it comes to scent is to not overdo it. You don't want to chase your customers out of your showroom. Choose just one scent and start burning it in your showroom every day. You may only need to burn it for a few hours in the morning to create that lasting scent. The right lighting in a showroom matters just as it does in a home. Too much and it can blind customers. Too little and your customers will have a hard time seeing your products well. But if you have a ton of windows in your showroom, then you also have to contend with the sunlight — or lack of it — outside. Like in a home, your showroom's lighting needs may change throughout the day, so your lighting fixtures should as well. 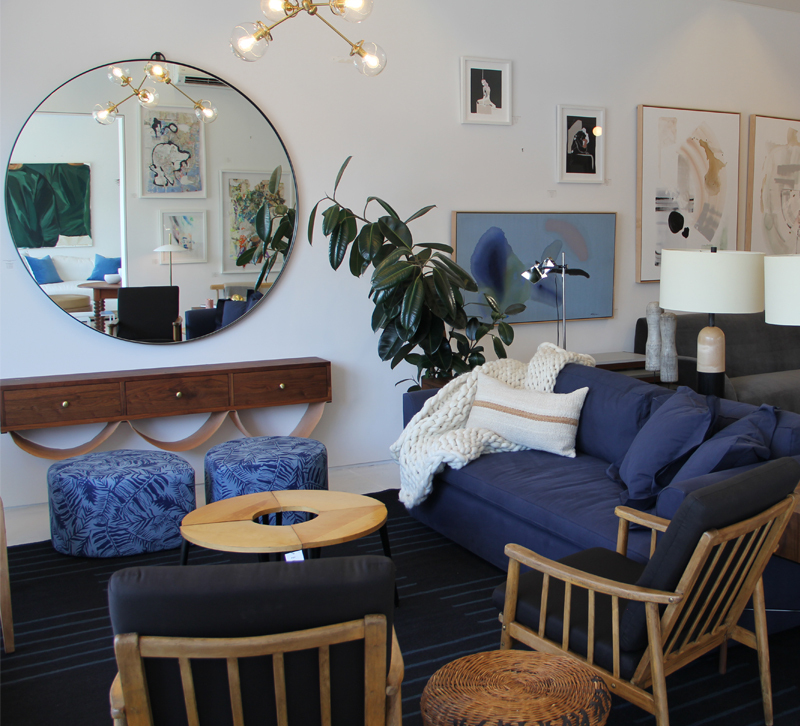 For furniture showrooms with just a few, well-chosen lighting fixtures and more commercial lighting, connect your commercial lighting to a dimmer to create ambiance no matter the time of day. If possible, add your lighting fixtures to the dimmer as well. This will be a great demonstration for your customers. For lighting showrooms, dimming every single fixture will definitely be difficult. Instead, dim the ones near windows to create more inviting spaces. This will also give you the opportunity to show off how different fixtures and bulbs can dim, something your customers will appreciate. How will you engage your customers' senses? Share with us in the comments!